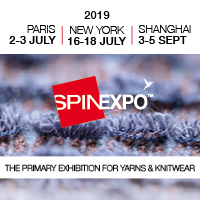 Yarn Expo Spring 2019 will see a significant increase in exhibitors at the Fancy Yarn Zone – a 75% increase – with 125 exhibitors now set to display their latest fancy yarn collections. Yarn Expo consistently offers new options at each edition, with a wide array of yarn and fibre products, from fancy yarn to high-quality wool yarn, cotton, chemical fibres and many more. Over 460 exhibitors from 11 countries and regions will join the fair, including China, France, Hong Kong, India, Indonesia, Korea, Pakistan, Singapore, Uzbekistan, Vietnam, and newcomer country Egypt. The fair will be held from 12-14 March at the National Exhibition and Convention Centre (Shanghai), and will be concurrent with four renowned fairs, including Intertextile Shanghai Apparel Fabrics, to attract the entire textile supply chain. Sourcing trends indicate that today’s consumers are more conscious of the materials that construct their clothes. As such, Yarn Expo has seen fashion brands like Adidas, Ralph Lauren and Zara source upstream in recent editions, partnering with yarn and fibre suppliers in order to meet consumer demand. For brands in the textile industry, Yarn Expo is a prime platform to find innovation, whether that’s in sustainable fibres, high-quality yarns or unique functional products. Functional and chemical fibre zones will showcase more new products with technological, fashionable and sustainable features. Domestic exhibitors can be found in four themed areas within these zones: China Fibre Trends 2019 / 2020, Innovative Functions, Green & Environmental Protection and Industrial Alliance. Cellulose fibres can be found at the Sateri Pavilion, led by leading viscose manufacturer Sateri Group. More product ranges can be found at the China Hi-Tech Corporation Pavilion. Meanwhile, the Natural Cotton Yarn zone will promote high-grade refined cotton yarn, as well as fine siro spinning, air jet vortex spinning, rotor spinning and functional yarn products. Highlighted areas in this zone include the Xinjiang Pavilion, led by the Xinjiang government, which will include 23 premium cotton spinning exhibitors. The China Fibre Trend Forum will focus on a curated selection of fibres from exhibitors, illustrating China’s 2019 / 2020 fibre trends. Meanwhile, academics, corporate executives and industry experts will closely interpret hot topics at the Textile Materials Innovation Forum. Themed around New Vision of Fibres, discussions will delve into the future of the fibre market: the direction of smart textile development, application demands for green textiles and the latest trends in textile product development – a series of talks that serve to enhance audiences’ business knowledge and insight. Launch events will also feature the latest products and technologies from selected exhibitors in a shared 1,000 sqm space in the fairground.